Can I get just a little classy on this series? Just this once? I promise googly eyes, etc. will return next week. 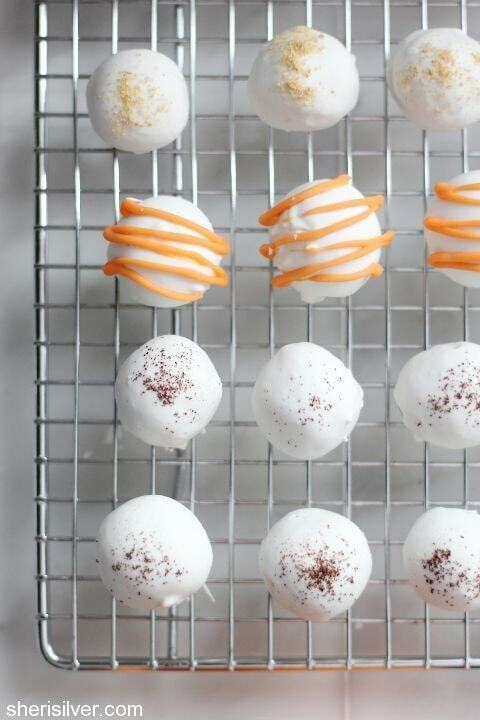 I’m so excited to be included in this year’s Virtual Pumpkin Party hosted by Sara, creator of Cake Over Steak (don’t you just love that name?). Over 60 bloggers are participating, and my mouth is watering over the beautiful and delicious recipes shared. In thinking about what recipe to contribute, I knew that I wanted to do something a bit more sophisticated than my usual Halloween fare. And having just made these amazing pumpkin spice latte doughnuts, I also knew that I wanted to incorporate those same flavors. Truth be told, I never understood the mania surrounding the yearly return of #PSL. But those doughnuts? The combination of espresso and pumpkin set my culinary heart aflutter, and I’ve been waiting for an excuse to do it again. 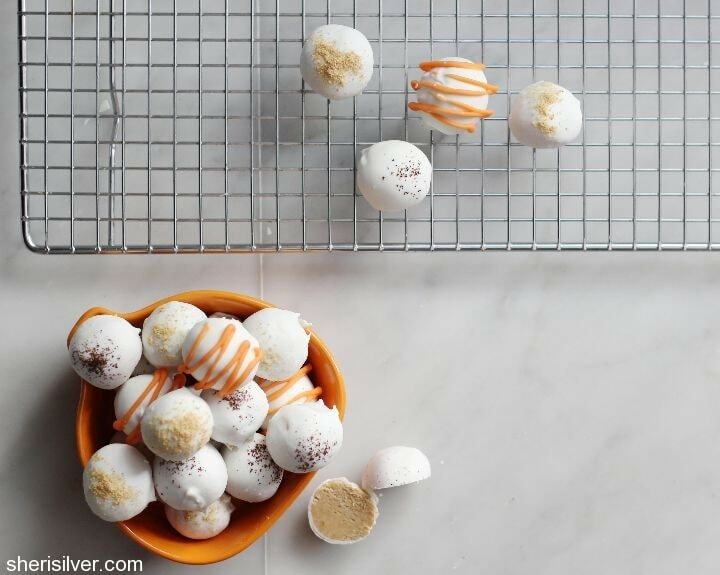 These truffles are delish guys – and super easy to make. While you’re waiting for the truffles to chill, head on over to Cake Over Steak to get the whole list of recipes she’s collected! 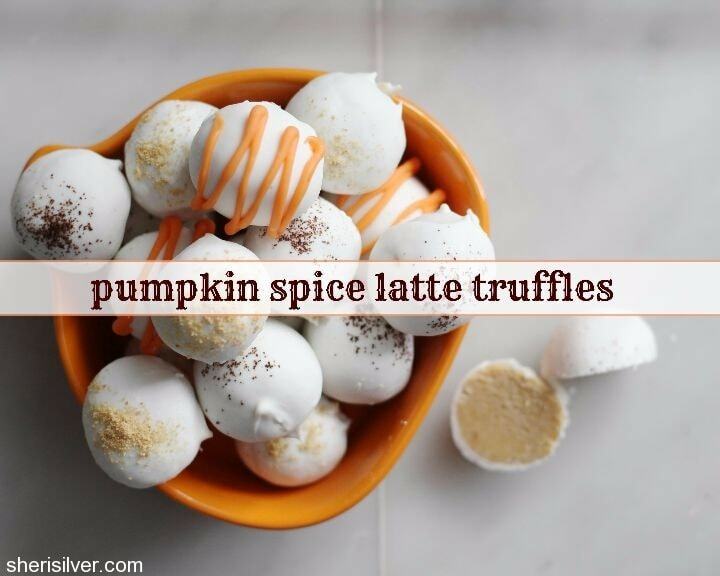 In the top half of a double boiler set over barely simmering water, melt 10 ounces of the white chocolate, the pumpkin, pumpkin pie spice, espresso and vanilla. Stir in the graham cracker crumbs and refrigerate the mixture till firm. Using a small (tablespoon-size) scoop or spoon, scoop the mixture onto a parchment-lined baking sheet. Shape into balls and place in the fridge till ready to dip. In the top half of a double boiler set over barely simmering water, melt the remaining 6 ounces of white chocolate. Add shortening, a bit at a time, till the chocolate is smooth and pourable. Turn off heat. Remove one truffle from the fridge and place on a fork. Hold the fork over the bowl of chocolate and use a spoon to pour it over the truffle. Gently tap the handle of the fork on the edge of the bowl so that the excess drips off. 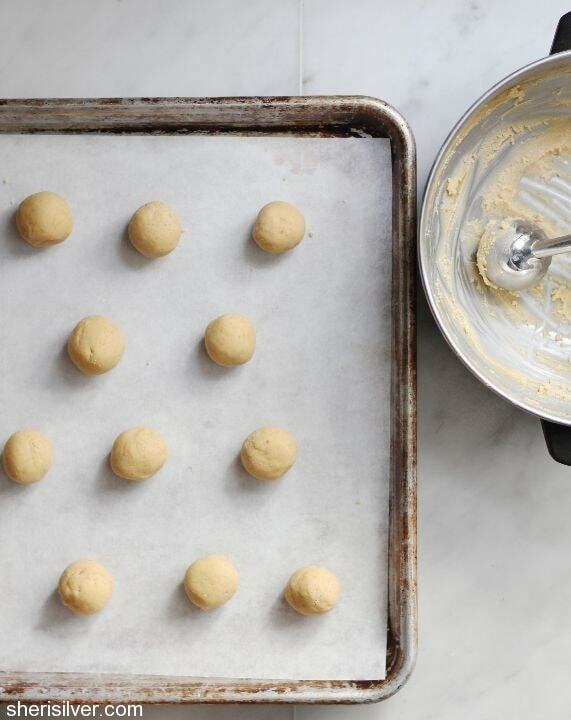 Use another fork to slide the truffle back onto your baking sheet. If topping with the graham cracker crumbs or espresso, do so now. If drizzling with orange candy melts, return to fridge to set. Repeat with remaining truffles and keep in the fridge till ready to serve. 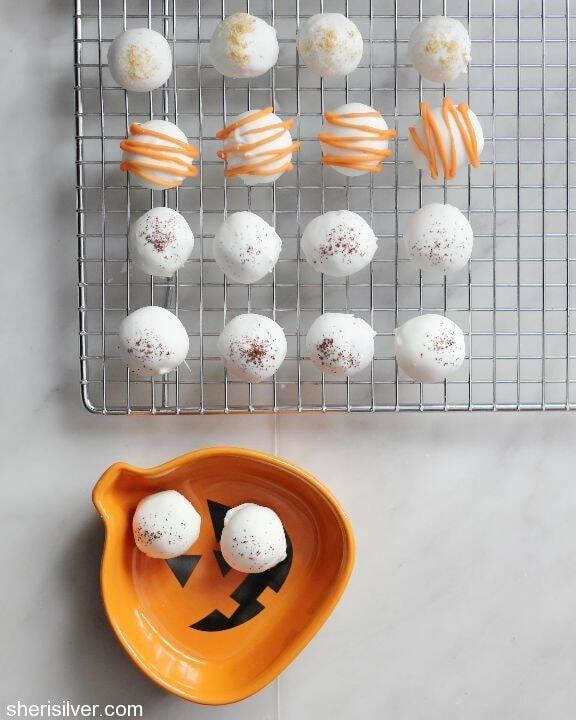 For more ideas, check out my Halloween Pinterest board! This are the cutest! Happy pumpkin party day! To you too! Those “ravioli” were gorgeous! 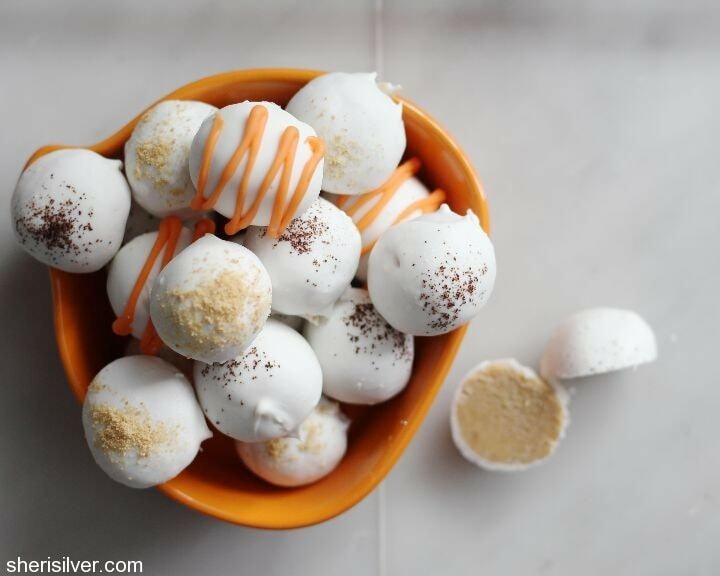 Mmmmm, I love white chocolate, but I’ve never had it with pumpkin. Sounds like a fantastic combination. It’s good. Really good. 😉 And I have to tell you that I’ve always been intimidated by yeasted waffles but your post looks amazing – I need to make these! These look so good! About how many pieces does this recipe make? I will be feeding a crowd…. Makes about 1-2 dozen – but you can easily double as this is a quick one! I love this idea, but I can’t have caffeine. What do you suggest I sub for the espresso?